The Cromarty is a classic VW camper van conversion that is ideal for families or for those who simply prefer more open living space. 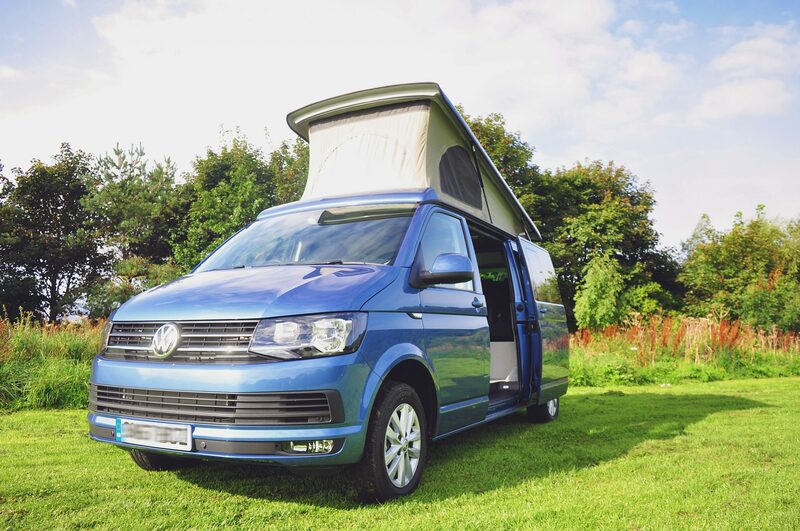 Built on a long wheel base VW T6 and with a 129cm wide double bed, the Cromarty easily doubles up as a second family car, but with an elevating pop top roof as standard it’s still only 2 metres high. UK National Small Series Type Approval certification – demonstrating full safety approval for use as a vehicle on the road. 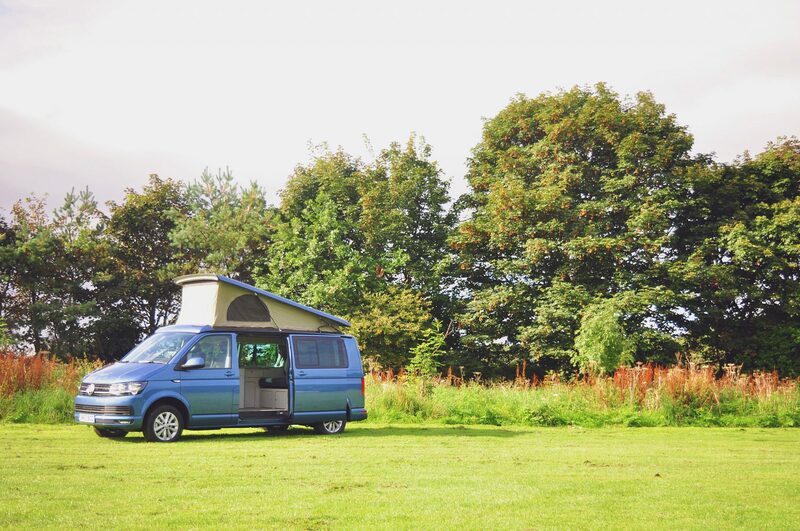 National Caravan Council (NCC) certification – demonstrating full approval to a wide range of habitation regulations that ensure the conversion is totally safe to live in as a campervan. Swivelling Front Seats – single passenger and driver comfort seats with swivelling seat base, armrests and lumber support. Charge Relay System – Varta AGM leisure battery with full intelligent split charge relay system that is compatible with Blue Motion energy saving brake recuperation. Simora Seat Fabric – upgraded seat fabric giving a more car style of finish. Touchscreen Digital Radio – with 5″ Colour Display, AUX-IN & USB in glove box (for connecting MP3 & iPod), SD card slot, CD drive and four Cab Loudspeakers. Bluetooth System – that will Connect your Mobile Phone through the Touchscreen Digital Radio. Trip Computer – displays Fuel Consumption and predicted Mileage from the Fuel in your Tank. Blue Motion Technology – improving fuel economy and reducing road tax duty. Start/stop engine system when stationary, low rolling resistance tyres and regenerative braking that charges your vehicle battery as you brake. Automatic Post-collision Braking System – triggers braking after a collision, with the aim of preventing secondary collisions. Driver Alert System – uses visual and acoustic warning signals to recommend that the driver takes a break as soon as it registers driving behaviour that indicates tiredness. Brake Assist System – registers the speed at which the brake pedal is pressed. During a reflexive or emergency braking action, it ensures that full brake pressure is built up more quickly. Our own Jerba Campervans top quality elevating roof with a maximum closed height of 2 metres. A VW factory fitted solid high top roof option is also available. As standard our Cromarty T6 conversion is fitted with our own top quality Jerba Campervans design elevating roof that when closed gives the campervan a maximum height of 2 metres – taking you under most car park height barriers. The whole canvas unzips all the way around to give you full light, fresh air and views – it also means that the canvas is fully removable by you at home in just a few minutes. For more details of the Jerba elevating roof click here. Midge proof (not just mosquito!) mesh on both zipped opening side windows is standard and a front opening clear window lets daylight flood in. With breathable natural cotton Ventile sides you’ll never suffer from condensation on the inside – a problem that non breathing plastic material elevating roofs experience on almost a nightly basis. We also seal every seam with full seam sealing tape, just like on the inside of your Goretex jacket. Applied by machine at our workshop it gives you an elevating roof that will stand up to the very worst of the weather. We also offer a solid fixed high top roof option on the Cromarty. This includes two opening high level side windows, a roof vent skylight and extra high level storage cupboards which aren’t possible within an elevating roof. Seats & Bed – belted seating for 5, fully tested to all European regulations, converting into huge bed measuring 130cm x 186cm – that’s just 5cm narrower than a standard UK double bed! Both cab seats swivel to face the rear. 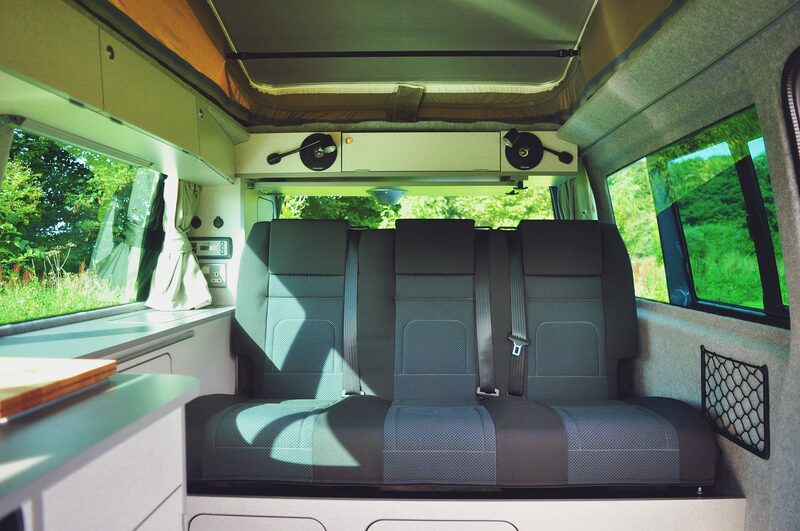 Seating five passengers our Cromarty VW campervan conversion is fitted as standard with fully belted rear seats that have been safety tested by Jerba Campervans to National Small Series Type Approval regulations – the highest level of European safety testing. Simulating an actual accident these regulations physically test the methods we use to secure the rear seats into our Cromarty camper conversion. 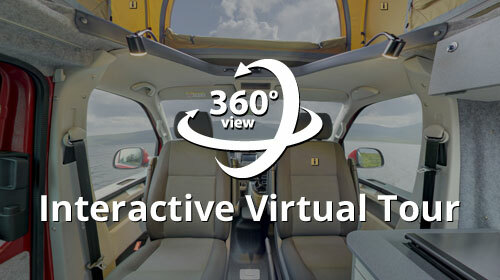 The rear seat is shaped for comfortable travelling and inverts to form a completely flat bed free of lumps and bumps. At 129cm wide the Cromarty seat converts simply into huge bed that is only 5cm’s narrower that a standard UK double bed. At 186cm in length the bed enables someone up to 6ft 1 inch tall to lie out flat – we do also have an option available to lengthen the bed to 6ft 5 inches. Integrated headrests are standard and simply push down into the seat for night time, avoiding the need to store them loose elsewhere. In the boot of the vehicle flexibility is also part of the design; the rear one third portion of the bed lying closest to the tailgate not only folds flat for sleeping, but can also be simply rotated into a vertical position allowing you to carry tall, large or awkward items easily in the boot. It’s a far more useful solution than a fixed parcel shelf. With VW factory fitted swivelling front passenger and driver’s seats as standard, it is a simple task to rotate the seat to face the rear and create a highly communal feel. Cupboards & Tables – our Cromarty furniture layout makes life easy with generous storage cupboards being accessible with the bed either up or down. We don’t simply assemble premade furniture kits, we scribe, cut and edge band in house and treat every camper van as an individual project. A high quality finish on your cupboards and lockers is often what makes your campervan stand out. Our Cromarty T6 conversion furniture is scribed and hand cut by our own finishing carpenters to fit perfectly to the shape of the campervan – you won’t find gaps down the back of our counter tops where you could lose your cutlery, pens and worst of all spilt food and drinks. 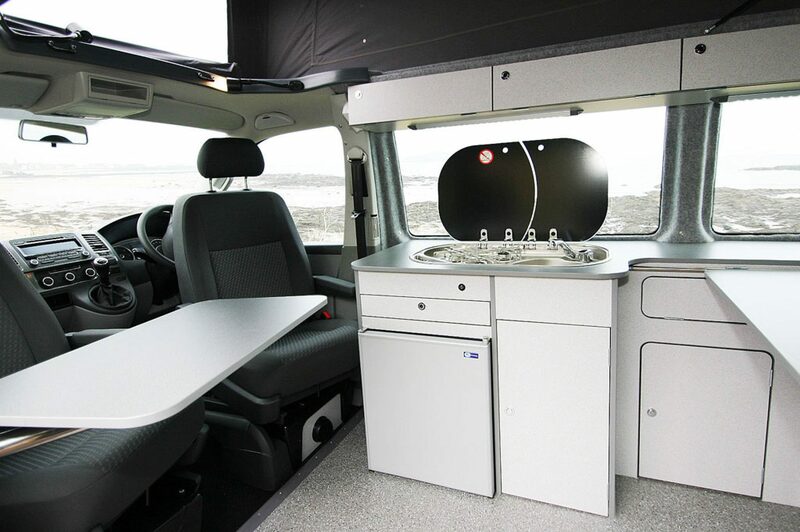 We don’t simply assemble premade furniture kits, we have invested in machinery and training to allow you to make changes to your furniture layout – a service that virtually no other UK VW campervan conversion company can offer. Where possible we also finish all our furniture with PVC edge banding, applied on our own in house machinery. Harder and far more durable than DIY style soft rubber trims, PVC edging gives a highly professional finish that is more familiar to kitchens at home. It will be as good after 5 years as it did after 5 days. All our furniture material is lightweight poplar ply which is produced specifically for the motorhome and campervan market. We only use designs that are fully laminated on both sides, giving you the maximum in hard wearing finish both inside and outside your cupboards – it won’t easily dent, cut and chip like many paper and vinyl covered products will. 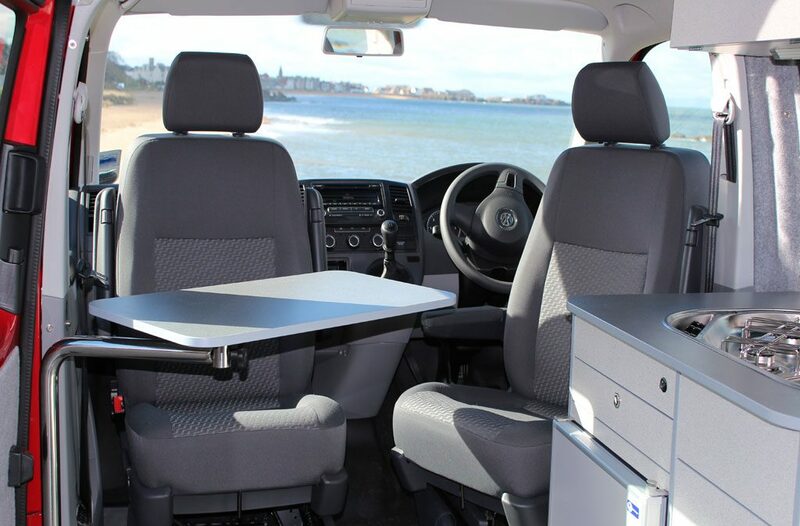 A fully adjustable table is fitted behind the front passenger seat use for when the seat is rotated – not only will this give a handy place at meal times or simply to put down your book or newspaper, but it can also be rotated to be outside of the sliding door for a table in the sun! For the rear passenger seat we provide a table with a removable leg that will give all three people sat on the rear seat a piece of table to actually use – it simply stows on the rear parcel shelf section of the back seat. As standard we also provide a folding tripod foot for the table so you can also use it free standing outside! An easy to use kitchen area that contains a combined three burner SMEV gas hob with sink alongside, located above a 62 litre fridge that is complete with freezer box. For the hob and sink, as standard we always fit Italian designed and manufactured SMEV products. With smoke glass lids they look stylish and provide vital counter top space when not in use. The Cromarty comes standard with a combined sink and three burner hob unit. For the Cromarty fridge we fit a 62 litre model made by Italian company Vitrifrigo, running solely from the 12v leisure battery it also includes a 4 litre freezer compartment. With a very low power usage it will on average take no more than 1.5 amps per hour. With 150amp hrs of leisure battery this will give you around 4 to 5 days of independence from mains power or driving the vehicle to recharge the leisure battery. To give almost complete summer time independence a serious option to consider is a roof mounted flush fitting solar panel. We fit a UK manufactured 100watt panel that has sufficient capacity to both run your fridge and your regular 12v appliances, as well as recharging your leisure battery. Be green and independent all in one! A fully sealed steel gas box, top grade electrical parts and individually tested certification from qualified gas and electrical engineers are standard in our Cromarty T6 conversion. Gas – all our conversions are fitted with a fully welded and sealed steel locker designed specifically to fit either two Camping Gaz 907 butane cylinders or two Calor 3.9kg propane cylinders – keeping a full cylinder safely stored at the rear of the locker will mean you should never run out. As an added safety feature, we place the locker in the boot so it’s impossible to close the vehicle tailgate without having first shut and secured the gas locker door – whenever you’re in the vehicle you’ll know the locker is safely sealed tight. It’s also simple to access to change the cylinder over. You don’t have to reach down into the depths of a cupboard, with a 1.5m hose you can simply place the cylinder on the ground by the tailgate. Giving you the option of fitting either propane or butane cylinders covers every eventuality. In sub zero temperatures, butane will burn poorly so propane is a better option. If you’re travelling to Europe then Camping Gaz butane cylinders are easy to find whilst the Calor propane are not – we stock a simple adapter that enables to quickly switch from one type of cylinder to the other. The locker also houses the compulsory gas regulator, has a completely sealed door and is vented through the floor of the vehicle – ensuring no gas leak will ever make its way into the living area of the vehicle. All LPG parts and appliances in our conversions are installed, tested and certificated by an LPG qualified engineer. 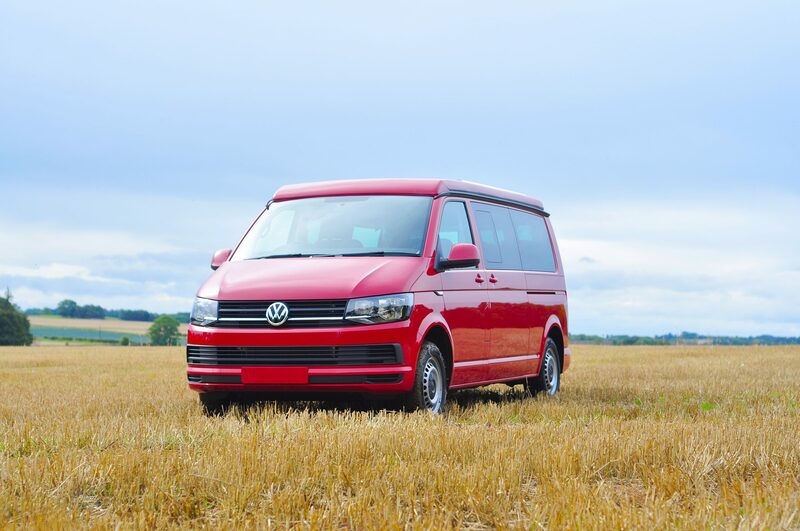 12v & 230v Electrics – to ensure that you have a reliable 12 volt supply we now order all our base T6 vans direct from Volkswagen with their factory fitted leisure battery and charge relay system installed. All T6 vans are now made as standard by VW with features to improve fuel economy and reduce polluting emissions, once such feature is known as engine brake recuperation – this basically allows the vehicle alternator to recharge the 12v battery system on braking as well as whilst accelerating, this reduces resistance on the engine and improves your miles per gallon. The mechanics behind this technology very closely monitors the charge of the vehicle battery and cuts off alternator charge if that battery is sufficiently charged, the downside is that if you have a leisure battery installed after the factory build then it can also cut the charge to that system as well. However, where VW install their own leisure battery system as a factory fit this problem is overcome as VW will programme the vehicle ECU (Electronic Control Unit) to ensure both batteries always receive the charge they need. The standard VW leisure battery is a 75 amp hour AGM (Absorbed Glass Mat) battery under the brand name of Varta and made by German firm Johnson. In any conversion where we add a diesel fired heating systems we add an identical VW Varta 75 amp hr AGM battery to double up your power to 150 amp hrs – this gives an identical arrangement as you would find in a VW California. To free up more storage in your campervan we always locate the additional 75 amp hr battery in a rigid stainless steel cage within a space on the underside of the van. By removing four bolts the cage can be simply lowered down, but as a sealed battery it is maintenance free. For the 12 volt and 230 volt power system we always install the high grade Sargent EC328 units. With fully integrated 12 volt and 230 volt consumer units (fuse boxes) and high quality charge relay system, life for you is as simple as it could be. A digital control panel will give you a range of information including leisure and vehicle battery charge, ampage draw, water tank level, outside/inside temperature and alarm set features. All our 230v fittings in every campervan are individually tested and certificated by a qualified electrical engineer. We don’t scrimp on insulation and aim to keep you warm in the winter and cool in the summer. Our high quality commercial grade flooring is fully insulated, non slip and looks great! 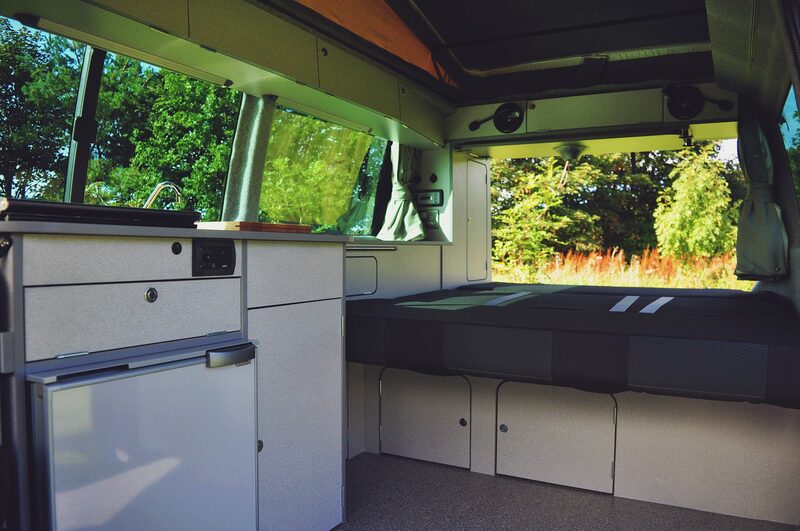 All our T6 campervan conversions are fully insulated behind all side cavity panels with a non allergenic, non irritant insulation that is comprised of 85% recycled plastic bottles and is an excellent and environmentally friendly insulation. UK manufactured by YBS Insulation it carries the brand name Non Itch, it has excellent Thermal Resistance and it is totally free from floating fibres or dust so avoids skin irritation and respiratory problems often associated with other forms of insulation. Being a plastic based product Non Itch will also never absorb any moisture or water and it also rates highly for sound deadening properties. Our ply floors are manufactured in the UK to our own design and consist of two layers of ply sandwiching a complete sheet of solid foam insulation – meaning you have insulation across the whole of your floor. 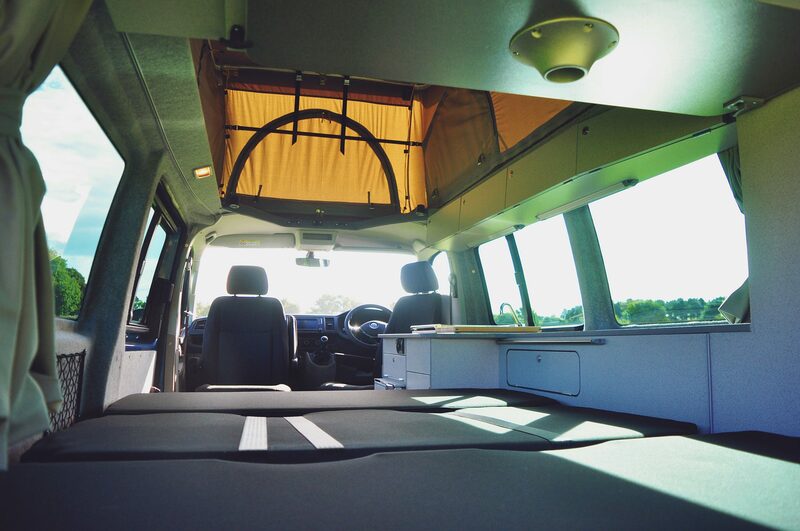 Our bespoke approach helps you retain more warmth inside your campervan in the winter and also improves the sound deadening effects. All the rear interior sides are fully trimmed in a specialised automobile carpet lining. This keeps you warmer in the winter, cooler in the summer and avoids condensation forming on the vehicle’s interior metal bodywork. We don’t simply clip on plastic panels or avoid trimming difficult areas. For the floor finish we find that most customers are looking for a practical easy cleaning solution which is hard wearing and most importantly non slip, so we fit a commercial grade vinyl that you’d normally find in locations such as sports centres. Available in a range of colours and finishes, wet shoes will always find a grip and with a super tough material you certainly won’t find the floor ripping, chipping and tearing. For a gas free camping experience try the diesel fuelled hob & hot air heating all in one option – enjoy more boot storage space, an easy clean glass surface, a single fuel source, no gas worries and far less condensation. There are plenty of positives! To use your campervan all year around you’ll often find a hot air heater is a valuable friend – we can also adapt heating systems into cooling fans for the hotter summer days. Blown hot air and continuous hot water from a heat exchanger system – all from a diesel fuelled system. You can even have a shower at the rear of the van! At 120cm, all our elevating roof beds are wide enough for two people to sleep, and with the strength to support 150kg, you’re OK with either adults or children. This internal lining layer not only makes your bed softer but also allows air to move beneath the fabric and quickly dry out any condensation. For taller customers we offer an increase in the length of the rear bed to 2 metres (6ft 6″) in all of our conversions. To attach any awning to the side of your T6 then you’ll first need an awning rail. The rail we use blends in to match the van and we stock a small range of high quality free standing awnings and sunshades. With 3mm solid steel sides and a high quality lock, our safe boxes are always securely located fully out of sight. Easily big enough for an ipad and other essentials to be hidden away. Simple to use and lightweight to handle, we design all our conversions so that the toilet is very easy to access and can always be simply stored out of sight. 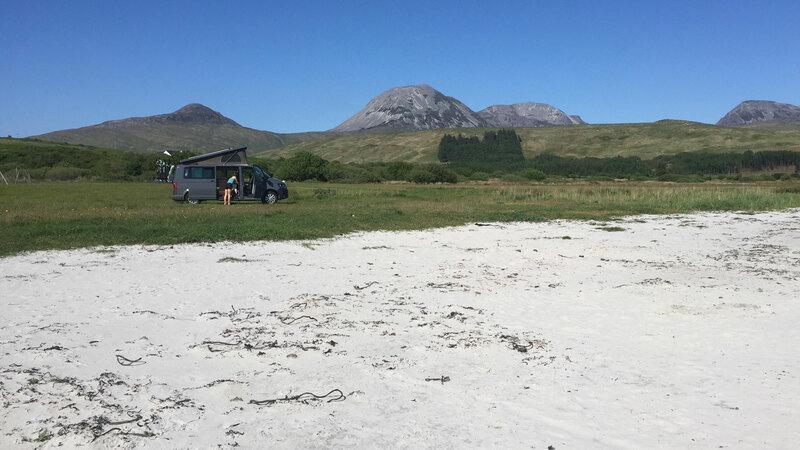 Keeping the smallest of biting insects out of your van can often be the difference between making or breaking a trip away – the West Highland midge is a particular offender! 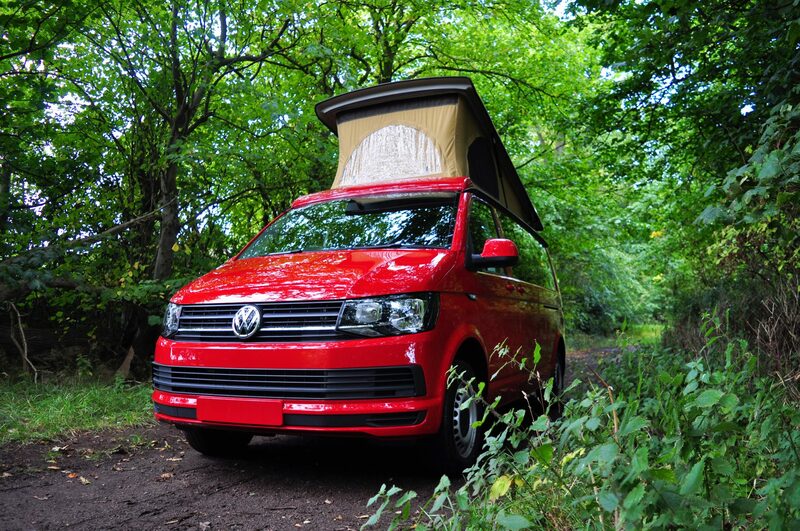 We’ve developed a screen for the rear side slide opening VW T6 windows that fit neatly into the open glass. With strength carrying capacity of up to 60kg it’s possible to carry a decent load on the elevating roof – two sea kayaks for instance. 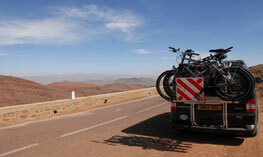 An easy fold down bike rack system that can carry up to four bikes with a tailgate or two bikes with double rear doors. No need to remove the rack when it’s not in use. 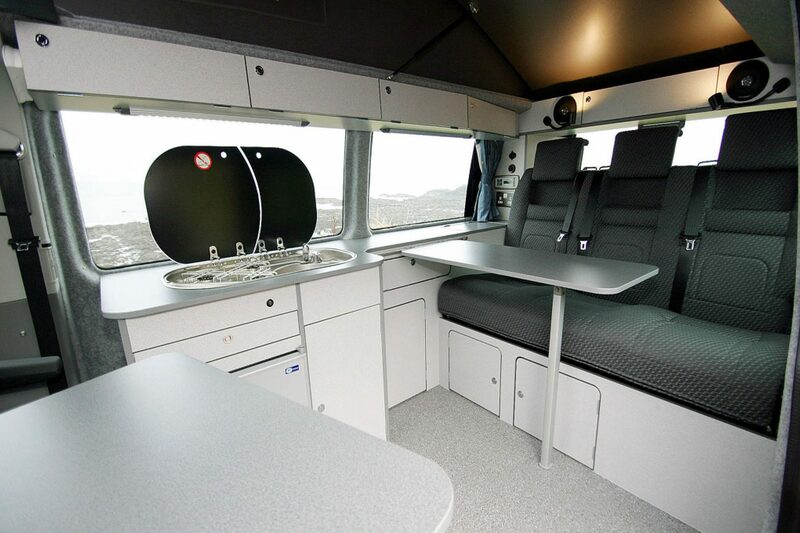 Change the look and feel of your campervan with full leather seating throughout. If you can’t be without your toast or crispy bacon then a grill may be a must for you – but remember that it will be at the cost of cupboard storage space. 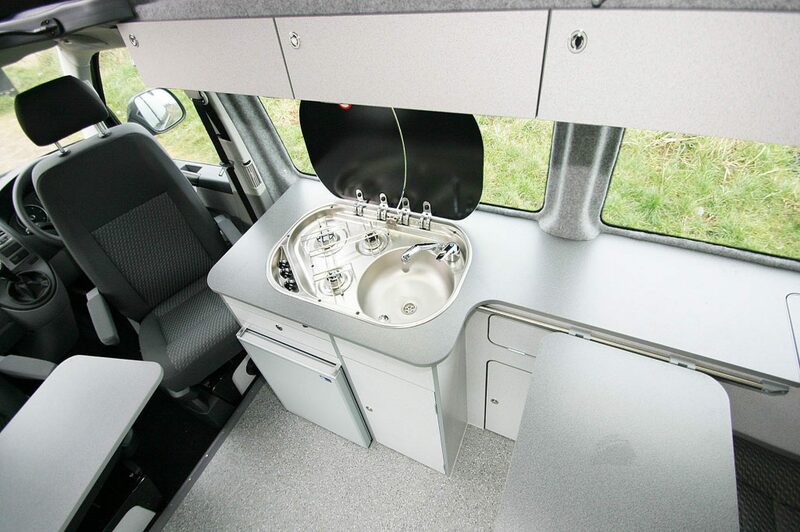 You can easily make toast though on our Wallas diesel fuelled hob option, so that’s worth a look! There are definite pro’s and con’s to having a waste water tank on your campervan, we hope our explanation will help you decide! If you’d prefer a solid high top roof instead of an elevating roof on your campervan, then with our Tiree, Cromarty, Taransay and Jpod conversions this isn’t a problem. Our workshop is fully open to visitors – we have nothing to hide! 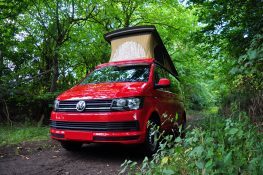 The campervan is pure delight, it puts a smile on my face every time I climb into it, particularly when the weather would make a tent distinctly unappealing! Whether it’s a leisurely week away, or just using her as a mobile changing room for mountain adventures - every time she makes me more sure that we chose the right camper for us. Excellent build quality comes as standard with this superb van conversion. We absolutely love our van! We haven't stopped driving around with big grins on our faces since we picked it up. 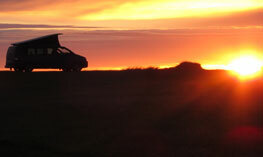 The amazing weather has been the icing on the cake and we cannot wait to tour Cornwall in it in June. 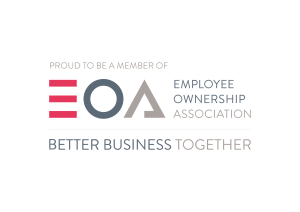 We're truly Happy Campers thanks to you and your team! 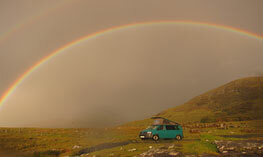 The campervan is wonderful! We have been out and about from the Lake District to the West Coast, Applecross, the East Coast at Dornoch and wild camping at Melon Oudrigle. So it's had a good test in various weathers, and I can tell you it passes with flying colours! Our new campervan has been excellent in all aspects and everyone that has viewed it has commented on the high quality of the interior build & fittings! Thanks again for your assistance. Jerba are there right at the front of the pack when it comes to keeping up with the latest legislation and are producing some very impressive products. We also love how precisely Jerba’s furnishings are cut to fit the T5: there are no nooks and gaps where you wouldn’t want them, such as between the kitchen unit and the van wall.